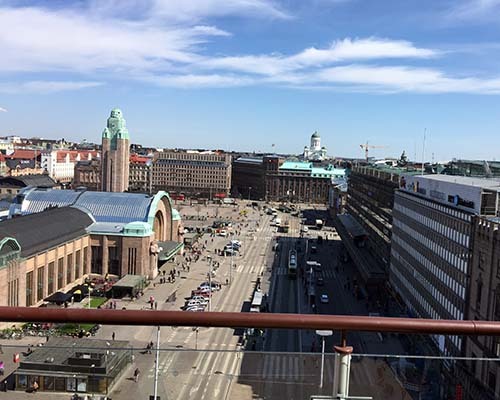 The Finnish capital of Helsinki is such a model, notably its Smart Kalasatama district - an experimental innovation platform to co-create smart infrastructure and services. Construction in the district is ongoing and encourages the piloting of very dynamic endeavors. It will be fully developed by 2030 to house 20,000 people and provide 8,000 jobs but already has 3,000 pioneering residents living in it. Its growth comes about through the cooperation of city officials, companies, citizens and other stakeholders. The city owns all the lands and leases them to investors with an eye to private investment and a push to get private partners to provide new services. Smart Kalasatama is by the sea and used to be a commercial harbor area. 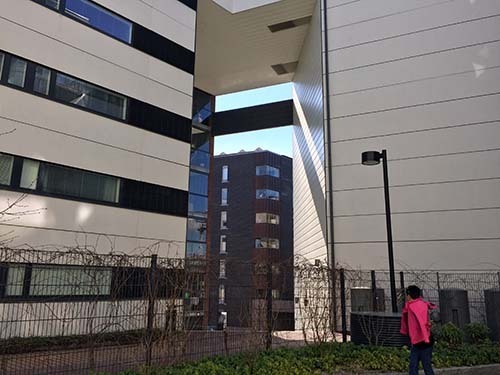 The vision for this urban district is to help free residents of one more hour a day from their everyday chores through co-creation, agile piloting, local smart services, and resource efficiency. It's the Internet of Things (IoT) at its best. The smart district is being developed through experimenting, information and communications technologies (ICTs) and the use of data. Apps are developed through co-creation. Helsinki actively promotes the use of open data, and is big on transparency in city administration, which makes it great for data journalism. The Finnish data journalism network's website includes tutorials and other self-study material for would-be data journalists, by using Excel and Google data tools. The Open Knowledge Foundation Finland founded in 2012 groups Finnish enthusiasts and experts of open data and is part of the world's largest open data community. The city maintains a co-creation platform called Helsinki Loves Developers and co-organizes hackathon programming marathons and open data apps competitions. This provides plenty of leeway for experimentation with real-life smart services for residents drawing on a wealth of big and small companies, entrepreneurs, research, the public sector and people. There's an innovators club for startups. Hence a rethinking of the workplace into a co-working space, given ubiquitous Wi-Fi connectivity, as well as the portability and mobility of devices, the right apps, and the requisite skills. In short: Pop-up work areas. 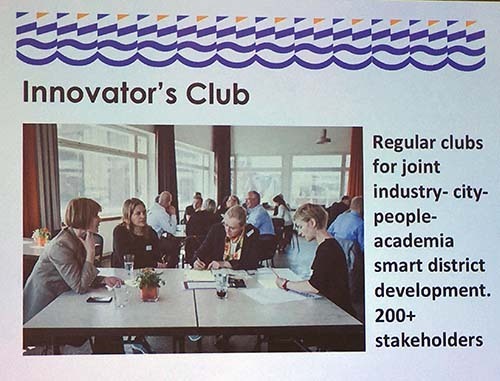 Smart Kalasatama has 200-plus stakeholders whose aim is to encourage smart and clean services that can be scaled up elsewhere. They include more than 30 city departments, residents, citizen organizations, industry, small and medium enterprises (SMEs), startups and academia. The portfolio comprises smart mobility, energy behavior, smart living, wellbeing, smart economy and learning. The five themes are included in over 20 projects. Smart energy is the foundation of the district. 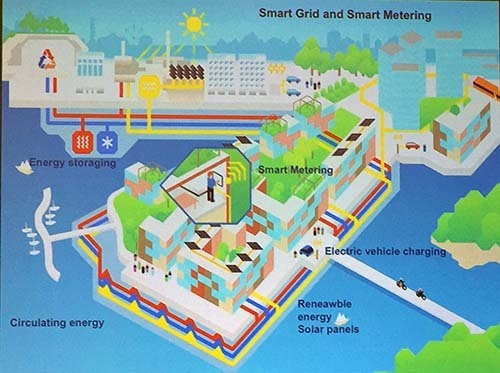 All buildings in Helsinki have to be part of the smart grid. 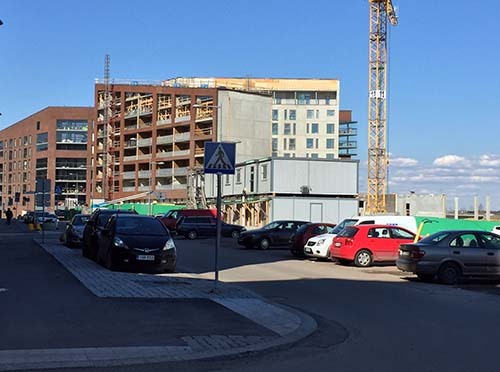 In Smart Kalasatama there's real-time metering control so even if residents are not at home, a remote control system enables them to check if their lights or any electrical appliances are on so they can turn them off. The system lets them monitor in real time the electricity and water use of their homes to optimize consumption. It also helps reduce energy use and CO2 emissions, pushes behavioral change, and promotes new technology acceptance. Residents use solar panels to produce renewable energy and the system allows for short-term power storage to even out peaks in consumption. The grid is meant to equip every third parking space with electric car charging technology, and, on a relaxing note, all buildings have saunas. 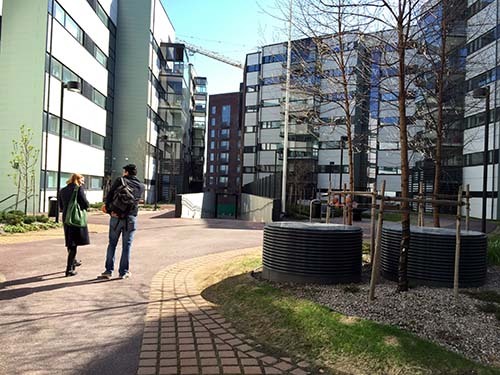 Co-creation is a core concept in Smart Kalasatama whose residents play key roles as testers of local smart services and initiators of sustainable, resource-efficient lifestyles. The Nifty Neighbor platform allows citizens to trade help services by co-creating a sharing economy. Being online is key. 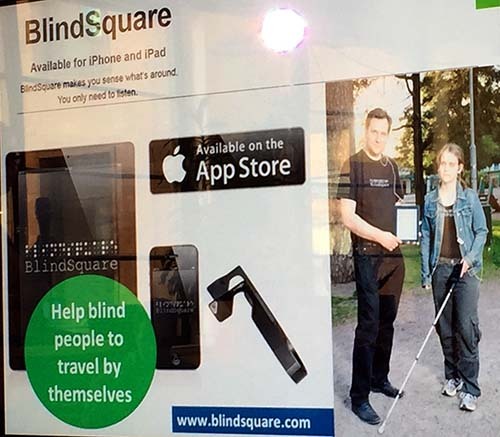 A success story of digital services developed from open data in Helsinki is the mobile GPS app BlindSquare that helps the blind and visually impaired navigate through the city by describing the environment, announcing points of interest and street intersections to users, and telling them where to go. It helps to have Forum Virium, a non-profit company that develops digital services, on board. Another vision is a shift in traditional pedagogical models in schools where classrooms are based on inquiry and there's an inclusion of more technology in education than in traditional learning institutions. Enter innovators and developers of new apps for schools. Meanwhile, when schools are not in use, they become community centers for the district's residents to discuss and plan more piloting projects and share other common interests. The Kalasatama Agile Piloting Program 2016-17 tests and develops 20 experimental service pilots in a real environment with real users. It procures small pilots worth up to 8,000 Euros ($9,003) each. Residents' initiatives have produced many local improvements, including playgrounds and landscaped construction sites. Citizens are encouraged to develop tailored housing concepts and one outcome is the co-created Senior House, a property and community in which elderly people live together assisting each other with everyday routines. 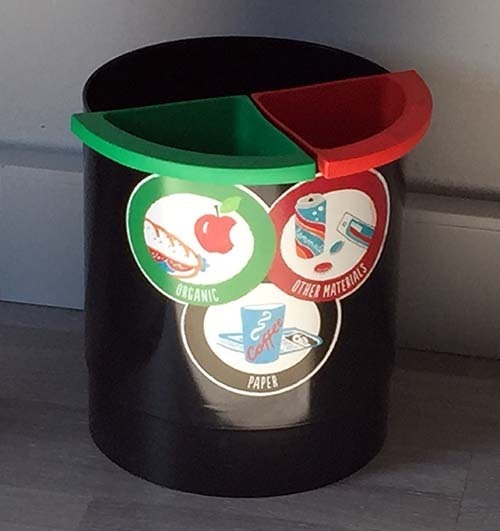 Another project involves smart trash bins and open waste data. The smart waste containers service relies on data produced by sensors to remotely monitor street waste containers to allow residents to make fault reports and give feedback. I was told the trash is automatically sucked through tubes from the receptacles to a processing center. 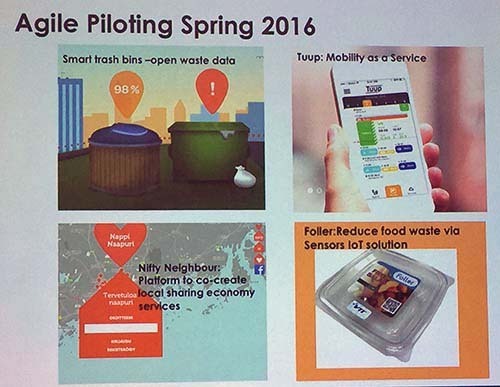 Another very efficient concept to reduce food waste lets sensors monitor foods in refrigerators of pilot homes as an app reminds residents of expiration dates and suggests how the foods can be used rather than thrown away. On transportation, Tuup contributes to mobility. Tuup is a Helsinki-based startup that is developing a mobile solution to make moving around urban areas a piece of cake. The solution integrates with one's calendar and provides an optimal plan for the day's travel needs, including public transportation, taxis, shared car services, bicycling and one's own car. A passenger pays for all transportation modes in one place - one road plan on one ticket. Tuup allows residents to share electric vehicles by booking them from a local electric car rental outlet. It is ultimately aimed at making car ownership a thing of the past. Once it takes off, the idea will be promoted beyond Helsinki.